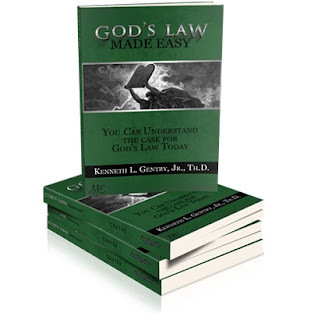 We are beginning chapter 2 of Ken Gentry's book God's Law Made Easy. This chapter is loaded with excellent Scriptural proofs for all of the important points. It won't be possible to cover each and every Biblical reference in this blog. In fact, the way Mr Gentry is able to make the book short is by not quoting each and every reference in that chapter. I do feel upon reading this chapter that a thorough Bible Study through this book would be incredibly beneficial for those who want to take serious the subject of theonomy. At the very least, those who want to criticize and disagree with them are given ample Biblical negotiating room. This chapter is deep. Even though it is only broken up into two major sections, each major section has multiple useful subsections that could rightfully constitute whole chapters. There are some very strong arguments in this section that non-theonomists will have to reject outright. Nevertheless, I applaud Mr Gentry's writing style and communication method in this chapter. It builds well off of the previous chapter and presents the subject in a thoughtful, concise and easy to follow manner. The two major sections to this chapter are The Law's Nature and The Law's Purpose. Within the section on the Law's Nature, there are many subsections that could be dissected in their own blog post. I'm going to save us from a 30 week series on a 100 page book. We'll be covering all of these sections and their Biblical defenses in this one post. The Law Represents the Presence of God. I'm not completely sure I agree with this statement. I can read the verses cited (Exo 24:12; 31:18; 32:16; 34:1, etc) and get the major drift, the law is the only portion of Scripture written directly by God. Unless you hold to the dictation theory for the rest of the Scriptures, this makes the law very unique. In all other portions of the Scriptures, there is a genuine and very real element of the human author in the writing. But not in the law. This is perfectly and solely God. Mr Gentry ties this inscription with God's finger to the active ministry of the kingdom (Luke 11:20; John 1:14; 12:45; 14:9; Col 1:15; Heb 1:3). If one believes the law is God's personal interact to bring about His kingdom then that same one must think slowly through why the modern church has discarded God's law so quickly. There are a lot of things I personally need to investigate in this section. I was recently awakened by the truth that Jesus quotes Moses as the source of divorce law (Matt 19:8; Mark 10:4) when the Old Testament reference gives no indication as such. No there are multiple hermeneutical reasons why Christ could speak this way but it remains an interesting subject for me. The Law Lies at the Very Heart of the New Covenant. The passages in Jeremiah and Hebrews have been under debate now for many things more important than theonomy. I won't go so far as to say that great portions of these passages have been neglected but there remain some interesting things to be identified and evaluated within these heavy portions of Scripture. Particularly in Jeremiah 31:31-33 is the phrase "I will put My law within them, and on their heart I will write it". There are many awesome things that could be said about this. There are many deeply theological things that could be said about this. Those must be set aside. Because in contrast to the unique inscription of the law by God discussed above, this should stand out more shockingly. What God previously wrote of His own accord apart from human interaction, He has promised to do yet again in the New Covenant. So far from moving away from God's law, God is bring the law into more intimate contact with the New Covenant member. Instead of seeing the law as abrogated should it be asked if the law was meant to be more manifest by the believing Christian and faithful church? Mr Gentry lists a ridiculous amount of passages to which I will only now give a small sample to close. These verses support the idea that God's law is everything written in the "law of Moses": Deut 30:10; Joshua 24:26; 2 Kings 10:31; 17:13; 1 Chron 22:12; 2 Chron 6:16; Ezra 7:6-21; Neh 8:8, 18; 9:3; Psalm 78:1; 81:4; 89:30; Isaiah 1:10; Jer 6:19; 9:13; 16:11; Dan 6:5; Hosea 4:6; 8:1; Luke 2:22-24, 39; 1 Cor 9:9. The Law Reflects God's Character. This section is good. But it is not essential to review it at depth for the sake of the argument. The basic purpose is to show that every characteristic we often attribute to God is also attributed to the law. This ties together very strongly the nature and essence of God's law. The major verse to be quoted in this section is that God does not change (Mal 3:6; 1 Sam 15:29; Jam 1:17). If a strong link is made between the nature of God and the law one will struggle to explain why the law is no longer in affect. Note, I understand completely how someone could make the link and then affirm the abrogation of the law. But I believe this does a great disservice to the continuity of Scripture and will ruin ones exegesis of many passages of Scripture. Just like in physics every action has an equal an opposite reaction, so also in the Scriptures every theological idea has a response and opposite reaction in the texts of Scripture. We must find our Biblical truths affirmed in Scripture. And we must find what we reject denied in Scripture. Many times people attempt to synthesize ideas and theological models without evaluating whether the texts themselves support the endeavor. I thought this portion of the book was very good (and very short). It is excellent for laying the ground work of application that many will find more disagreeable. But if the level of disagreement changes then we can be assured that we have not understood this chapter. Next post we will look at The Purpose of God's Law.